…Brendan Rodgers had made a good stab at a case for the defining moment of this campaign not to be that infamous stumble against Chelsea. The Liverpool manager tried to argue that an offside call against Raheem Sterling at the Etihad on Boxing Day was somehow more pivotal. But it was obvious early on, as Newcastle’s band of visitors began that chant about Gerrard and his slip presenting the ball to Demba Ba, that the image will be remembered as the catalyst in this remarkable season’s twisting folklore. By all accounts it provided the soundtrack to the final day, as that Gerrard song peppered the atmosphere at the Etihad, and the refrain echoed from supporters of Chelsea, Manchester United, Arsenal. There was only one way for the Liverpool faithful to respond, and that was by putting a metaphorical arm around his shoulder, enveloping their man in support. They drowned out Newcastle jibes with ear-splitting odes to their number 8. Out there on the pitch in front of them, Gerrard went about his game quietly. There were no captain’s gestures, there was no verbal encouragement. He looked shattered. Gerrard was involved in both of his side’s goals, the arch provider able to affect the game from a standing start. He stood over the set pieces. There were stung palms on the Kop in front of him, lavishing applause. The reaction was all about respect and recognition for their captain. His deliveries were textbook – hallmark balls whipped in with precision, pace and tantalising bend. 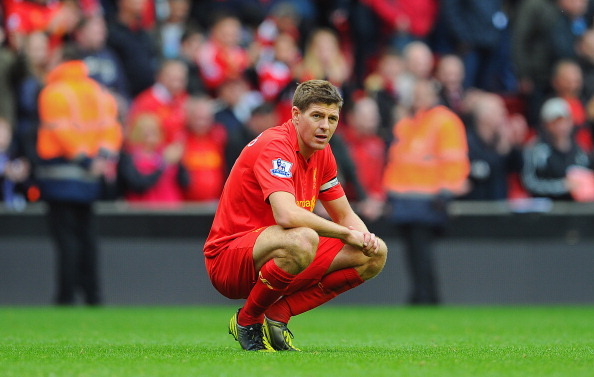 But what was most revealing about the man and his state of mind was that Gerrard struggled to celebrate. After both Daniel Agger’s equaliser and Daniel Sturridge’s winner, he merely turned and began walking back, head bowed, low key, to the centre circle. His team-mates came to slap hands with him. He obliged, but there were was no overt euphoria. “I can certainly play at this level for another year,” he said. “I feel strong.” The reinvention that has seen him operate as a deep-lying quarterback gives him the capacity to carry on. But in the meantime he looks like he could do with a clear break to get away from the pressures and fatigue this season has brought to bear. In reality he must now prepare himself for another spell in a burning spotlight next month, when he captains England in Brazil. That is some shift of focus. In his own words, Gerrard will have to find the willpower to go again. I really feel sorry for Gerrard as he typifies a dying breed – the loyal one club man, once prevalent in the game and now in danger of extinction. If anyone ever deserved a Premier League winner’s medal it surely must be him. Besides, the tick tock tock tick of Man U, Man C… and Chelsea once in a while, is dull in the extreme. I know Liverpool absolutely dominated English football for many years but they have served their punishment in my view and I would certainly welcome them back as regular and realistic contenders in the coming years. And as you rightly point out the man has a double burden to bear with his role as England captain… 1966, 48 years of pain, and all that! Surely when he retires the Football Association can acknowledge his huge contribution to the game with a medal all of this own – a medal of honor along the lines of ‘Champion of the English Game’ or the like. I’m not counting them out by any means but with a resurgent Man U, a restored Man C, and a hungry Chelsea I just can’t see The Reds repeating this phenomenal season any time soon.